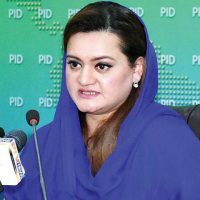 ISLAMABAD: Minister of State for Information, Broadcasting and National Heritage Marriyum Aurangzeb on Friday strongly condemned the murder of a senior journalist Haroon Khan in Swabi. She expressed her heartfelt sympathies and condolence for the bereaved family and prayed for elevation of the ranks of the departed soul. She urged the KP government to arrest the culprits immediately and arraign them before the court for justice. The minister said journalism and democracy were sine quo non for each other and the government was taking appropriate measures for the safety and security of journalists.